This is all true, and should be written somewhere in the historybooks of watches. However, I gave the ‘golden age’ of mechanical watches a long thought and I think the Golden Age of mechanical watches was not in the era that Chris mentions, but I think it is now. Ofcourse, in the days before tuningfork and quartz, people had no choice. They had to wear a mechanical watch, so in that point of view, it was at least the ‘age’ of mechanical watches. However, the golden-part should be added after that era. In these days, a mechanical watch is luxury. You can buy a 10 Euro quartz watch in the supermarket, a quality quartz watch like a Seiko or Swatch can be had for 40 Euro. That money doesn’t buy you a mechanical watch. People who adore mechanical watches are paying extra. And like every ‘extra’ in life for luxury, you have certain levels of it [luxury]. You can adore cars and be perfectly happy with your restored MGB, but some people take it a few steps further and buy Jaguar E and XK types for hobby. There is currently a market for extremes, and watchmanufacturers know this ofcourse. Although it is hard to do any new inventions in mechanical watches, they do add new features and try to perfect these. 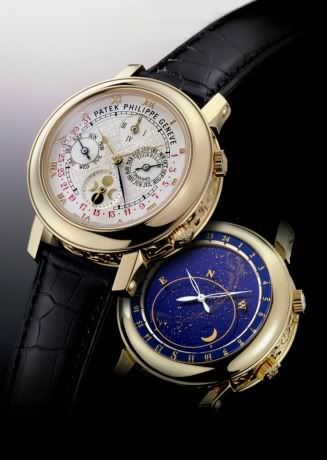 Would there be a Patek Skymoon tourbillon in the age of mechanical watches? I think not. It would be too expensive and maybe because the lack of modern design technology. So the golden age of mechanical watches, where mechanical watches are luxury anyway, allow them to make a watch like this. And it gets sold as well. Would there be a Panerai Tourbillon diverwatch? I think not, because this complication is completely useless on a diverswatch. It is for people that have everything already. However, how long will this golden age of mechanical watches last? The former age of mechanical watches, between 1940 and 1970, Japanese quartzwatches passed the Swiss mechanicalwatch industry and they (the Swiss) couldn’t catch up with them. Only later (1990-now), where mechanical watches are considered to be luxury, things are going well again. But since they are doing extreme things now, tourbillon divers for example, how long is this going to last? How much Speedmaster variants is Omega going to produce, how many Panerai variants are going to spoil the market, how many different Breitling Navitimers models do you want to see? Ofcourse, having a choice between 10 different Speedmaster models is great for the customer, but it requires some investment from the company who makes them. Spoiling the market is the beginning of the end. I think the Golden Age of mechanical watches will come to an end as soon as people are getting bored with the many variants of watches coming out. Which is already the case with people who are fortunate enough to take it one step further and focus on high-end watches like Patek complications or other exotic watches like F.P. Journe/Jacquet Droz/Richard Mille etc. But for those who can’t…. One thing is certain, we (mechanical watchfreaks) don’t have to fear for Japanese quartzwatches which killed the mechanical era in the late 1970s, we don’t like them anyway. I think it will be boredom and the lack of affordable innovation which will end it. In my opinion, one of the things that can save us, is moving over to brands that make nice and affordable watches who have to offer something nice as well, something different. Think BRM, Sinn, Bell & Ross, Chronoswiss, Ventura or other independant watchcompanies.